There are over 1,000,000 charity golf tournaments played annually in the U.S. alone. Sponsorship money covers most of the tournament costs with the remainder going towards the charity or cause. While most sponsors are pleased to donate to a charity they are seeking something in return generally in the form of brand promotion and recognition. Tee signs, feather flags and welcome banners are popular options to promote but they all lack one important element – mobility. Each is stationed somewhere on the course so they receive message exposure only upon arrival when golfers register or when a group of golfers approaches a hole to tee off. That leaves plenty of downtime when nobody is present to see the signage. In fact, teeing off only accounts for a small percentage of time during a 4 hour round of golf. The rest of the time is spent navigating the course and taking shots to advance in the direction of the flag pin. Birdie Media took advantage of this inconsistent advertising approach and developed exclusive mobile products that travel with the golfers on each cart so sponsorship is visible for the entire round. Our Birdie Banners attach to the back of each golf cart ensuring that their message is received every time players select or return a club. Birdie CaddieCuffs consist of 3 cylindrical ads positioned at eye-level on the front frame pillars making them nearly impossible to miss. 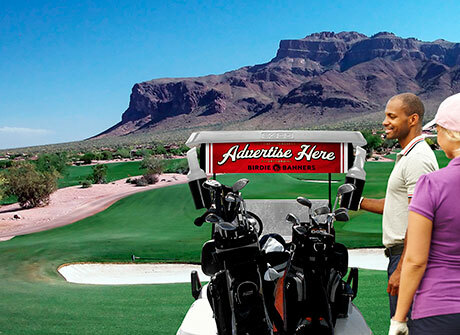 Positioning signage in a location that is present and visible for the entire golf round greatly improves the chance that sponsors will be seen and remembered. There is a psychological phenomenon known as the “Mere-Exposure Effect” whereas people develop a preference for something simply because it is familiar to them. This effect is also known as the “Familiarity Principle”. Studies have shown that this relationship extends to a number of things including icons, pictures, words, number sequences, geometric shapes, sounds and illustrations. This effect directly influences people to be more favorable towards something based on the frequency of exposure. Let’s face it, the primary reason to hold charity golf events is to raise money for a specific cause. Sponsors are a necessity for raising money and supporting the event. If the outcome is successful it will be much easier to retain a previous sponsor than acquire a new one so it is paramount that sponsors are properly represented. Sponsors are much likelier to support future tournaments if they feel that their donation was money well-spent. Attractive premium signage projects class and professionalism and encourages participation and larger donations from future sponsors. Trust Birdie Media for your next tournament and see how our eye-catching signature products are a more effective promotional option for sponsors.